So only 23 days until Christmas, and between now and then Prog Magazine will be bringing you a prog Christmas song every day to help you get in the festive spirit! 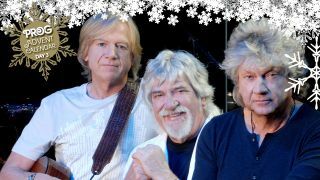 Today it's the turn of the Moody Blues, and their take on David Essex's A Winter's Tale, which was taken from the band's 2003 album December, their own collection of seasonal favourites (and outside of their 1965 debut album The Magnificent Moodies, the only Moody Blues album to feature cover versions). December was not only the last studio album the band have released, but the first as a trio after the late Ray Thomas had stepped down from the band. A Winter's Tale, penned by Mike Batt and Tim Rice, was originally a 1982 No. 2 hit for David Essex kept off the top of the charts by Phil Collins' You Can't Hurry Love!